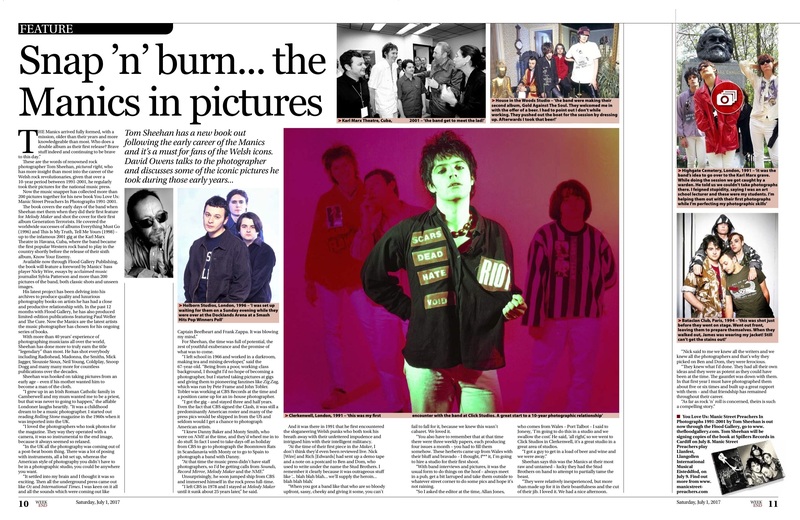 Tom Sheehan has more insight than most into the career of the Manic Street Preachers, given that over a 10-year period between 1991-2001, he regularly took their pictures for the national music press. Now the music snapper has collected more than 200 pictures together for his new book You Love Us: Manic Street Preachers In Photographs 1991-2001. The book covers the early days of the band when Sheehan met them for their first feature for Melody Maker and shot the cover for their first album Generation Terrorists. He covered the worldwide successes of albums Everything Must Go (1996) and This Is My Truth, Tell Me Yours (1998) – up to the infamous 2001 gig at the Karl Marx Theatre in Havana, Cuba, where the band became the first popular Western rock band to play in the country shortly before the release of their sixth album, Know Your Enemy. Available now through Flood Gallery Publishing, the book will feature a foreword by Manics’ bass player Nicky Wire, essays by acclaimed music journalist Sylvia Patterson and more than 200 pictures of the band, both classic shots and unseen images. His latest project has been delving into his archives to produce quality and luxurious photography books on artists he has had a close and productive relationship with. In the past 12 months with Flood Gallery, he has also produced limited-edition publications featuring Paul Weller and The Cure. Now the Manics are the latest artists the music photographer has chosen for his ongoing series of books. With more than 40 years’ experience of photographing musicians all over the world, Sheehan has done more to truly earn the title “legendary” than most. He has shot everybody including Radiohead, Madonna, the Smiths, Mick Jagger, Siouxsie Sioux, Neil Young, Coldplay, Snoop Dogg and many many more for countless publications over the decades. Sheehan was hooked on taking pictures from an early age – even if his mother wanted him to become a man of the cloth. “I grew up in an Irish Roman Catholic family in Camberwell and my mum wanted me to be a priest, but that was never to going to happen,” the affable Londoner laughs heartily. “It was a childhood dream to be a music photographer. I started out reading Rolling Stone magazine in the 1960s when it was imported into the UK. “I loved the photographers who took photos for the magazine. The way they operated with a camera, it was so instrumental to the end image, because it always seemed so relaxed. “In the UK all the photography was coming out of a post-beat boom thing. There was a lot of posing with instruments, all a bit set up, whereas the American style of photography you didn’t have to be in a photographic studio, you could be anywhere you want. For Sheehan, the time was full of potential, the zest of youthful exuberance and the promise of what was to come. “I left school in 1966 and worked in a darkroom, making tea and mixing developer,” said the 67-year-old. “Being from a poor, working-class background, I thought I’d no hope of becoming a photographer, but I started taking pictures at gigs and giving them to pioneering fanzines like Zig Zag, which was run by Pete Frame and John Tobler. Tobler was working at CBS Records at the time and a position came up for an in-house photographer. “I got the gig – and stayed three and half years. Even the fact that CBS signed the Clash, it was still a predominantly American roster and many of the press pics would be shipped in from the US and seldom would I get a chance to photograph American artists. “I knew Danny Baker and Monty Smith, who were on NME at the time, and they’d wheel me in to do stuff. In fact I used to take days off as holiday from CBS to go to photograph the Boomtown Rats in Scandanavia with Monty or to go to Spain to photograph a band with Danny. Unsurprisingly, he soon jumped ship from CBS and immersed himself in the rock press full-time. “I left CBS in 1978 and I stayed at Melody Maker until it sunk about 25 years later,” he said. And it was there in 1991 that he first encountered the sloganeering Welsh punks who both took his breath away with their unfettered impudence and intrigued him with their intelligent militancy. "The Manics arrived fully formed, with a mission, older than their years and more knowledgeable than most," said Sheehan. "Who does a double album as their first release? Brave stuff indeed and continuing to be brave to this day. “At the time of their first piece in the Maker, I don’t think they’d even been reviewed live. Nick [Wire] and Rich [Edwards] had sent up a demo tape and a note on a postcard to Ben and Dom, who used to write under the name the Stud Brothers. I remember it clearly because it was outrageous stuff like ‘... blah blah blah... we’ll supply the heroin... blah blah blah’. “When you got a band like that who are so bloody upfront, sassy, cheeky and giving it some, you can’t fail to fall for it, because we knew this wasn’t cabaret. We loved it. “You also have to remember that at that time there were three weekly papers, each producing four issues a month – you had to fill them somehow. These herberts came up from Wales with their bluff and bravado – I thought, f*** it, I’m going to hire a studio for their first shoot. “With band interviews and pictures, it was the usual form to do things on the hoof – always meet in a pub, get a bit larruped and take them outside to whatever street corner to do some pics and hope it’s not raining. “So I asked the editor at the time, Allan Jones, who comes from Wales – Port Talbot – I said to Jonesy, ‘I’m going to do this in a studio and we swallow the cost’. He said, ‘all right’, so we went to Click Studios in Clerkenwell, it’s a great studio in a great area of studios. Sheehan says this was the Manics at their most raw and untamed – lucky they had the Stud Brothers on hand to attempt to partially tame the beast. “They were relatively inexperienced, but more than made up for it in their boastfulness and the cut of their jib. I loved it. We had a nice afternoon. “Nick said to me we knew all the writers and we knew all the photographers and that’s why they picked on Ben and Dom, they were ferocious. “They knew what I’d done. They had all their own ideas and they were as potent as they could have been at the time. The gauntlet was down with them. In that first year I must have photographed them about five or six times and built up a great rapport with them – and that friendship has remained throughout their career. This page was last modified on 22 March 2018, at 20:46.